The Rama Gardens...A luxurious resort in the city occupy two low-rise wings, located only 5 minutes from the airport and 20 minutes to down town. It consists of 500 newly refurbished rooms and suites situated amidst a well manicured 26 acres of gardens with two lake-sized swimming pools plus a modern sports complex. It is a premier property surrounded by lush greenery acres of grass expanses, tranquil lotus ponds and tropical floral all year round. To make each guest feel at home, Rama Gardens Hotel Bangkok furnishes each of its 500 rooms and suites, with an atmosphere of comfort including luxuries and amenities like mini bars, colour television with satellite news. Our 24-hour room service makes guests feel pampered and we provide a key card system, IDD, voice mail message, and laundry service. 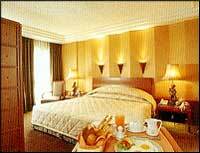 Adding to the relaxation, each room opens to a serene view of the Rama Gardens Hotel's scenic landscape. With accommodations as welcoming as these, you may never want to leave. The lates addition to our property is the Grand Courtyard, an 11-storey facility comprising 138 executive deluxe rooms and suites fitted with an extensive range of amenities and IT facilities that are ideally suited for business executives an their families. Lift your spirits and recharge yourself for life in the new millennium at our state-of -the-art Sports Complex. 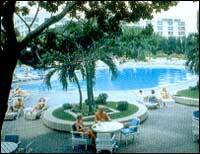 It offers an unprecedented array of outdoor and indoor sports and leisure activities. Rama Gardens recreational facilities include fitness and aerobic training, swimming, tennis, squash, badminton, basketball, jogging tracks, golf putting greens and much much more. And after a vigorous workout, relax your mind and body with a soothing sauna, steam or massage.